Launching ‘Still Waiting’, her Review of children’s and young people’s mental health services and support in Northern Ireland, Koulla Yiasouma, Northern Ireland Commissioner for Children and Young People, said “We are delivering yesterday’s services for today’s children. The Commissioner launched her Review in June 2017 which has been the most extensive engagement with children and young people about their direct experiences of accessing, or trying to access, support for their mental health. It considered the whole system, from support provided by GPs, the education system, the Voluntary and Community Sector, specialist mental health services, A&E and hospital care. It also heard from parents, carers and professionals working within the system. Koulla said “I have found the system wanting in areas such as lengthy waiting times, the high proportion of children not being accepted to specialist services, problems with access to services for children with learning difficulties, or drug and alcohol issues, unacceptable failings in the care of children in mental health crises, and reliance on the use of medication to treat mental ill health. However, all these areas can be addressed if prioritised - even now without an Executive. 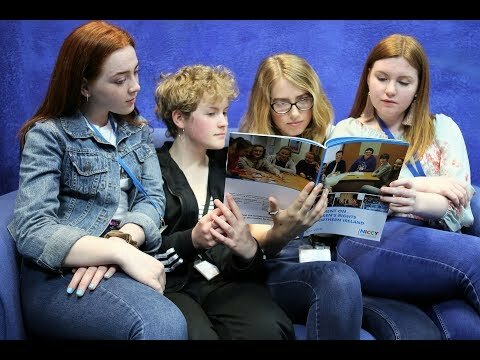 “Even though many young people told us about the challenges they faced in accessing the right support, 8 out of 10 said they would encourage others to seek help for their mental health and we have certainly found professionals going ‘above and beyond’ to support young people within extremely stretched resources. The title ‘Still Waiting’ refers to the length of time young people wait before seeking help, and the time it takes for them to receive the right support. The Review also considered the data collected and held by the system. “I welcome the recent announcement that the Department of Health will fund Northern Ireland’s first study to assess the mental health needs of our children and young people. However, I would question how we have been planning and commissioning services when we are not yet fully aware of the exact needs of our children” said the Commissioner. The Review considered money spent on child and adolescent emotional and mental health support across the system, including early intervention and prevention services, something which has not been done before. Koulla said, “It is widely understood that spend on mental health is inadequate, particularly when considering the impact the legacy of the conflict continues to have on mental health, including those generations seemingly not directly affected. “My Review found that approximately £31 Million is spent here on children’s emotional wellbeing and mental health services which represents 0.8% of our overall health budget, equating to less than 1 penny in every pound. This lack of investment is very short sighted. The Commissioner concluded “Children and young people’s mental health has been one of my key priorities since taking up post. I initiated this Review because of the young people who approached me when I visited their schools, the parents who approached me in the supermarket and the professionals who approached me when I visited their workplace. All urged me to do something about mental health services and support for children and young people. *Stepped Care Model – is the regionally agreed model for the organisation and delivery of child and adolescent mental health services in NI. It is a 5 tiered model which recognised the need to develop a whole system approach to the delivery of services which includes connections between statutory mental health services and primary care, education, child health and social services. The model has not been fully implemented, and continues to be a work in progress. Please see the Review report here and an infographic here. You can read the press release from the launch of the review, in June 2017, here, which contains some information on prevalence of children’s mental health in Northern Ireland. If you are a young person and need support with your mental health talk to your parents/guardians, GP, teacher or another trusted adult. Childline 0800 1111 childline.org.uk Childline provides a 24 hour free telephone advice line and online 1-2-1 chat advice for any child or young person who has a concern. Samaritans 116 123 samaritans.org Samaritans offers a confidential hotline which is free to use by anyone who needs help. They also have branches across Northern Ireland. Contact NI 0808 808 8000 contactni.com Contact NI runs school based, community based and specialist counselling services free of charge. They also run the lifeline helpline. [i] Kessler RC, Berglund P, Demler O, Jin R, Merikangas KR, Walters EE. (2005). Lifetime Prevalence and Age-of-Onset Distributions of DSM-IV Disorders in the National Comorbidity Survey Replication. Archives of General Psychiatry, 62 (6) pp. 593-602. doi:10.1001/archpsyc.62.6.593.